Registration forms and details are available. Read the letters from Archbishop Viganó (in English) : first letter,third letter. 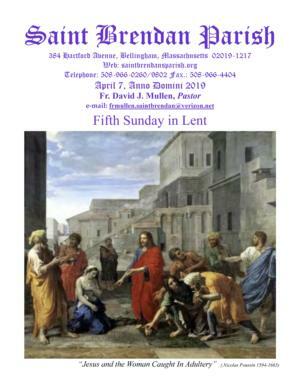 Sunday at 8:30 AM, 10:30 AM, and 5:30 P.M.
Saturday at 3:00 - 4:30 P.M. and prior to Mass at 5:00 P.M. 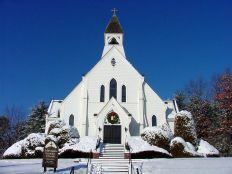 If you are new to St. Brendan's and would like to register in the parish, please call the Parish Office (508) 966-9802. 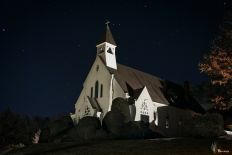 Saint Brendan's is a Catholic Church in Bellingham, Massachusetts. This web site provides links and info of interest to Saint Brendan's Parishioners, Christians, and Pro-Lifers. St. Brendan's Church, parish offices, restrooms, and Fr. Gilmartin Hall are wheelchair accessible and smoke-free. The Mission of the Catholic Communities of St. Blaise and St. Brendan is to be a people dedicated to spreading the Good News of God’s saving love to all, as we journey together in faith. As a sacramental people, united in the Eucharist, we seek to develop the full and active participation of all peoples and strengthen our relationship with Jesus Christ. Through the guidance of the Holy Spirit, we strive to give witness to God’s word and through the teachings of Jesus Christ actively follow the Gospel message by living the corporal and spiritual works of mercy.